Continuing to build on the legacy of imaging innovations, Panasonic announced the launch of its much awaited full-frame mirrorlessLumix S series in the Indian market. Comprising of LUMIX S1 and S1R with 24 megapixel and 47.3 megapixel full-frame CMOS sensor respectively, the new S series is based on the L-Mount standard, which provides uncompromised imaging experience. Marking the entry in still photography segment with LUMIX S1R, the camera integrates a 47.3-megapixel full-frame CMOS sensor (36mm x 24mm), which gives it the industry’s highest level of resolution in the full-frame mirrorless cameras*2, to pursue the ultimate power of expression. In addition to the precise reproduction capability in detail, this sensor achieves a high S/N ratio by taking advantage of its high light-condensing efficiency despite the large number of pixels. The LUMIX S1R features a High Resolution mode for the first time as a mirrorless full-frame camera to enable 187-megapixel ultra-high precisionphoto with a pixel shift technology shooting. 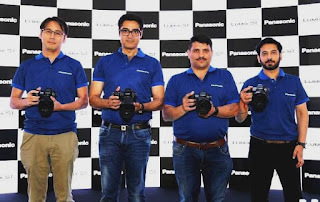 Panasonic has achieved a high-speed AF with its advanced control technology over the major devices - lens, sensor and imaging engine. The lens and sensor communicate at a maximum 480 fps. Combining the Contrast AF with DFD technology, the LUMIX S1R/S1 realizes an ultra-high-speed, high-precision AF of approximately 0.08 sec*1. The LUMIX S1R/S1 also boasts high speed burst shooting at 9 fps (AFS) or 6 fps (AFC).